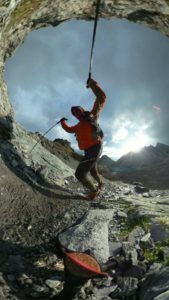 Since I started trail and mountain running adventures, I’ve experimented with different forms of recording the experience. When you’re traversing many kilometers up and down it’s important to keep weight to a minimum. In the past I’ve used a Ricoh GR Digital, GoPro, and Sony E-mount cameras like the NEX5/6. Since last year I’ve been running with the Ricoh Theta (M15/S) 360 camera. The Ricoh Theta looks like two cameras in one. It has two lenses and two image sensors. Thanks to an optical prism (see the excellent teardown report from XUEMING) design the sensors are packaged next to the lenses as opposed to being directly behind each one. Since each lens is pointed directly opposite to each other, successive images can be combined to capture an entire scene. Each lens has a field of view (FOV) over 180 degrees, and the resulting single images can be stitched together to give a 360 (spherical) image. This allows a great deal of flexibility after the image has been taken. You could, for example, embed the final 360 image in a 360 panorama viewer. This allows a viewer to spin around their perspective, or view the image with some VR goggles, like Google Cardboard, for a VR photo experience. 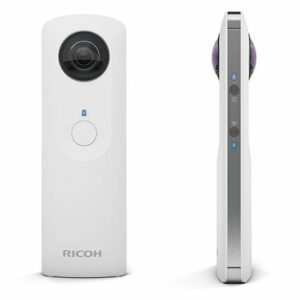 The Theta camera can be controlled from a button on the camera or controlled via the Ricoh smartphone app. This gives a great deal of flexibility in controlling the camera for stills, time-lapse, 360 video, all with manual control. There’s also HDR functionality for still images. Beyond the 360 imaging experience, you can take the 360 image and process it in various ways. You can then cut out a section of the 360 image and post it as a planar 2D image, or compress the sphere in different ways to a plane. This gives a great deal of flexibility to explore and compose the image after it was taken. I’m rather partial to this, as it allows you to make a panorama, or change to a little planet view. All this can be done on your smartphone, and images posted to Twitter, Facebook, Instagram, etc. This goes against the old photographer mantra of “get it right in camera” but I’m happy to use technology in the best way possible. Grabbing a 360 image lets you move fast and document the event, which are usually opposing ambitions. In addition to trail running and mountaineering the Theta is awesome for live events, such as the Zurich Street Parade. The Theta lets you live in the moment instead of being a reporter…I imagine Hunter S. Thompson would have loved it. People are often overly concerned with composition when you put a camera in their hands, and the Ricoh Theta takes care of this distraction. In a small package you can run with the Theta, pull it out when needed, shoot, and keep on running. I’ve taken the Theta on various mountain adventures in the Swiss Alps and plan to take it to the Xreid in Norway this July. This entry was posted in 360 Camera, Running Gear and tagged 360, Ricoh Theta S, Trail Running, VR by Mark Melnykowycz. Bookmark the permalink. Mark is an Artist / Engineer who likes to explore the mountain environments of the world. He climbs, and climbs, takes pictures along the way and writes on little pieces of paper that make their way into articles for the world wide web. He also loves to write gear reviews and runs on trails in Switzerland.